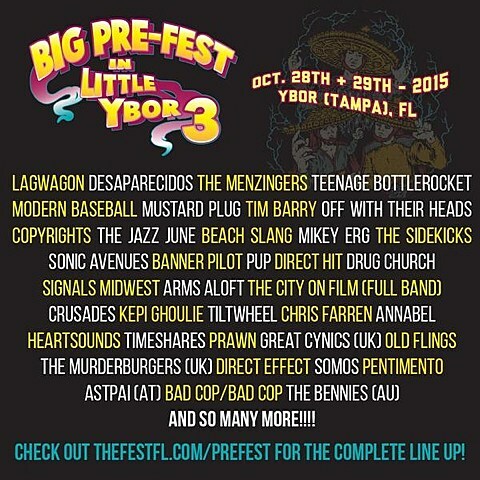 Gainesville’s annual punk festival The Fest returns in 2015 for its 14th year (hence Fest 14) from October 30 to November 1, and like in previous years, a handful of the bands play Pre-Fest in Little Ybor from October 28-29. 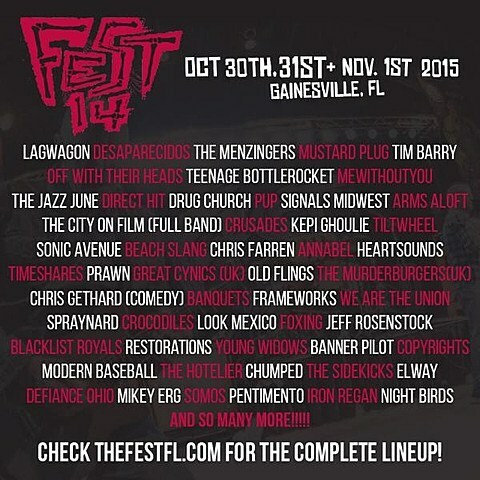 This year’s initial lineup was just announced and it includes Desaparecidos, The Menzingers, mewithoutYou, Tim Barry, The Jazz June, Drug Church, Pup, The City on Film, Kepi Ghoulie, Beach Slang, Frameworks, Foxing, Iron Reagan, Crocodiles, Cult Leader, Young Widows, Xerxes, Jeff Rosenstock, Restorations, Modern Baseball, The Hotelier, Chumped, The Sidekicks, Mikey Erg, Night Birds, Tiltwheel, Lagwagon, Off With Their Heads, Teenage Bottlerocket and many more. Tickets are set to go on sale via The Fest’s website June 1.